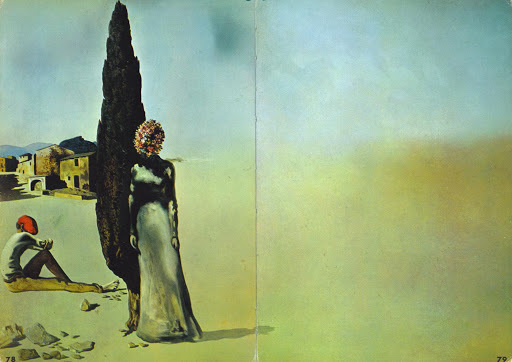 the painting above is my favorite by dali: necrophilic springtime, discovered in the book dali by dali which i came across several years ago, in my days of frequenting the berkeley public library (a place where, in addition to allowing me to discover this painting, also ignited my love of xiu xiu and helped complete my kieslowski cravings). awhile after my initial discovery of it, still unable to discern anything from the internet and still enthralled by the image, i tracked down a used copy of dali by dali on amazon (amazon informs me, vaguely creepily, that i purchased it on june 3, 2008 for $4.50) and obtained the book for my shelves. “1 If intelligence does not exist at birth, it will not exist at all. 2 If men go on dying, blame Jules Verne, he was logical. 3 To be logical is to be cuckolded every day by truth and ugliness. 4 What is truth? Less than nothing. 5 What is ugliness? Ugliness is that which cuckolds you every time with beauty. 6 What is beauty? No one knows yet, since it is too obvious. logical in its illogicalness. perfect in its perfection. This entry was posted in color, painting, promotions, ps, sentences and tagged 1936, art, artist, berkeley public library, book, dali by dali, illogical, kieslowski, logic, logical, necrophilic springtime, painting, paintings, salvador dali, surreal, surrealism, xiu xiu by Alison Kranz. Bookmark the permalink.